A goose quill is more dangerous than a lion’s claw. 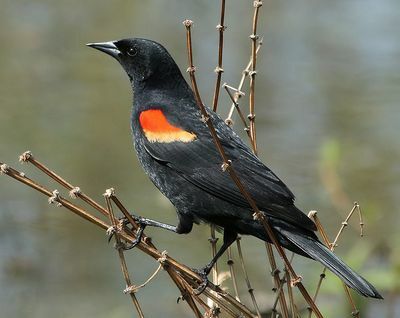 The Red-winged Blackbird (Agelaius phoeniceus) is a passerine bird of the family Icteridae found in most of North and much of Central America. The Red-winged Blackbird inhabits open grassy areas. It generally prefers wetlands, and inhabits both freshwater and saltwater marshes. It is also found in dry upland areas, where it such inhabits meadows, prairies, and old fields. The Red-winged Blackbird is sexually dimorphic. Seeds and insects make up the bulk of the Red-winged Blackbird’s diet. Agelaius phoeniceus, English proverb, family Icteridae, Goose, passerine bird, Red-winged Blackbird. Bookmark.